There was some event at the Island Grounds – a Trade Fair, Industrial Fair, political party tamasha? Large tents were set up with a mushroom of small colourful tents. These dwarfed the huts and life teeming there in the foreground. The sky was washed a luminous blue after the rain, the evening hung like a turquoise pendant when I left home. I walked past the slushy streets of Virugambakkam market to a quiet lane colonized by sleeping dogs. A truck pulled in and unloaded bananas before a row of wholesale shops. The shops were empty, the floors were covered with dry leaves. 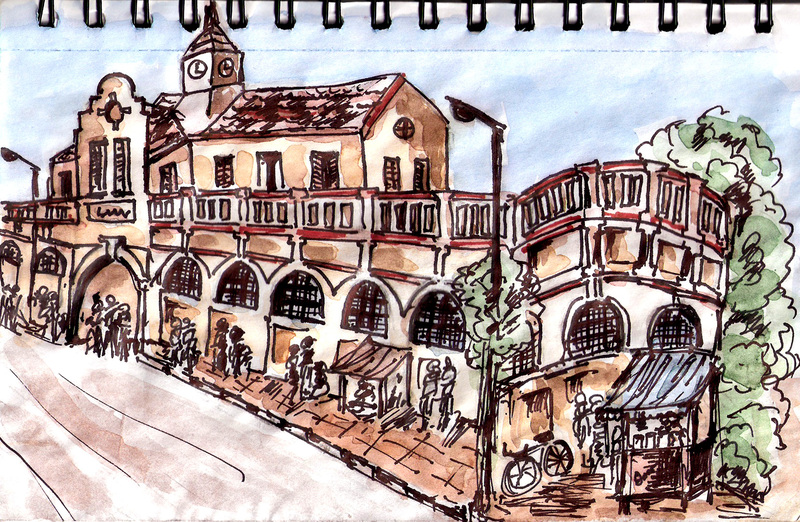 I sketched the bananas stacked outside these shops before they were taken in. The sleeping dogs did not mind my company, one of them cheerlessly looked up and curled back to sleep as I mixed colours in my palette to paint the very blue day. He is from Bihar and has tried his hands at various jobs in Chennai. He has worked as a table cleaner in a restaurant, has worked at a paan shop outside a large hotel, worked in a chaat shop where he learnt the art of mixing spices. All his jobs kept him long hours at work, and that made him decide to slow down a bit. He wanted to start a business of his own that would call for very little investment and give him lot of time to loiter and laze about. 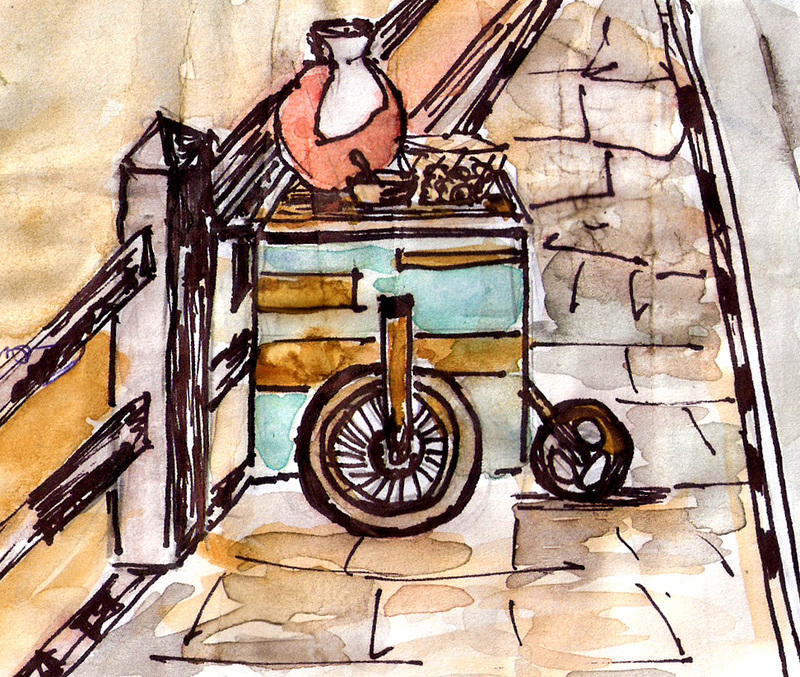 He pooled in his little savings and bought the cart that serves as his workplace and shop. He thus became the popular paani puri man in the neighbourhood. His morning is not rushed. He gets up late and spends a couple of hours getting ready the potatoes, spiced paani, tamarind and mint chutneys . He has a bath at two in the afternoon, tucks wads of paan in his mouth and leaves for work humming a popular Bollywood song. He wheels in his shop at about three in the afternoon to the gate of the school. He sits on the pavement and chats with the boy who has come to sell spiced peanuts for the school children. A woman spreads her wares of dexterously sliced raw mangoes sprinkled liberally with chilli powder. The business for the afternoon will begin as soon as the school closes for the day. I am awed by the undaunted spirit of small entrepreneurs and small time traders. 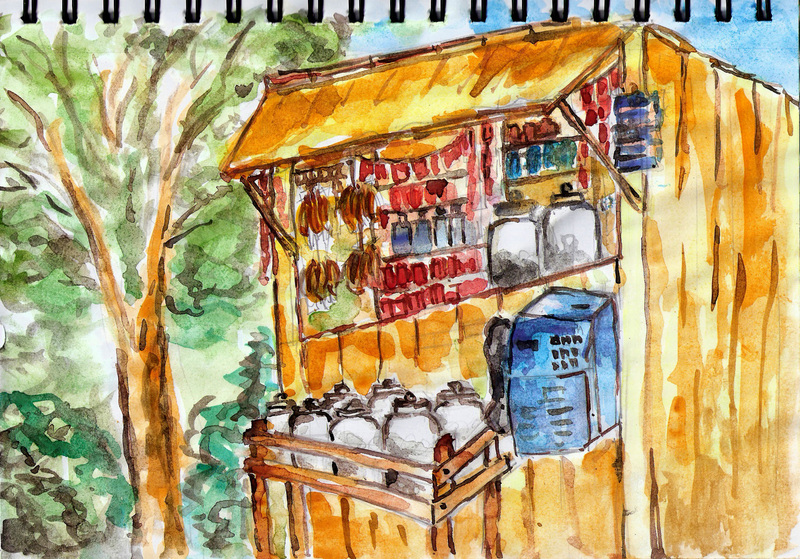 I shall begin a series of sketches on such small enterprises. The first one is the petti kadai or the roadside bunkshop. I found this sunshine shop under a large shady tree on a quiet road leading from a village as it intersected the highway to Bangalore. I think this shop moves because I did not see it on my drive back to Chennai from Bangalore. The shop was meant to cater to the needs of the villagers who waited for bus at the bus stop closeby. The shop offered cookies, bananas, scented betel nuts, cigarettes, shampoo sachets, water bottles. There was also a cheerful blue telephone booth that I saw a few people use. I bought some coconut and butter cookies stored in large glass jars, my husband bought a few honey flavoured lozenges. The shop keeper allowed my son to pick his toffees from the glass jar placed on a rickety wooden table. I wonder why the shop moved: did it move into the village or to a busier junction on the highway? The astute entrepreneur would have had his reasons for moving. It rained all day, but I kept to my program of driving to the Thousand Lights mosque in Anna Salai. 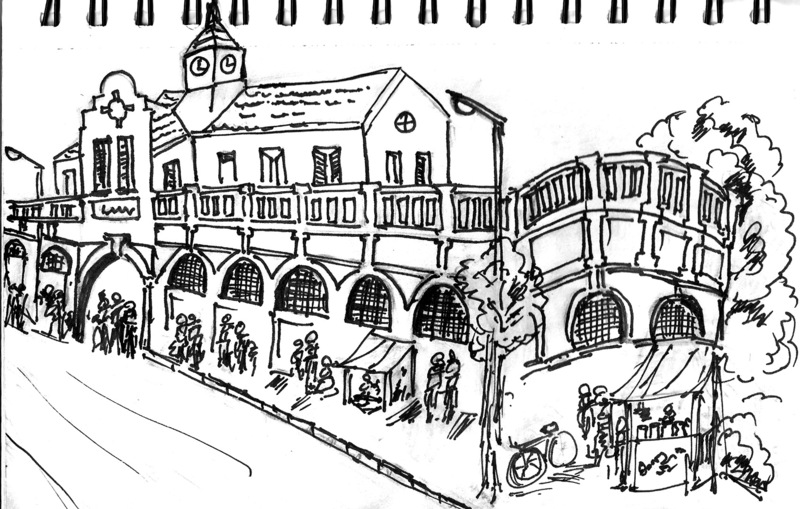 I made a quick sketch, took a couple of photographs as the crowd of pedestrians in raincoats and umbrellas milled around me. 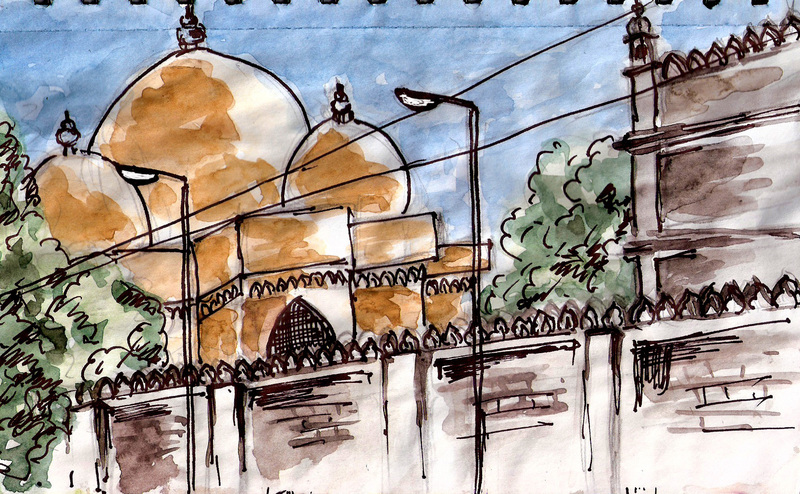 I have sketched the part of the mosque seen above the traffic from Anna Salai. The Thousand Lights mosque was built in 1820 on three acre land donated by the Nawab of Wallajah. It is located in the heart of Chennai city on an arterial road where government offices, educational institutions, commercial establishments like theatres, shopping malls are established. 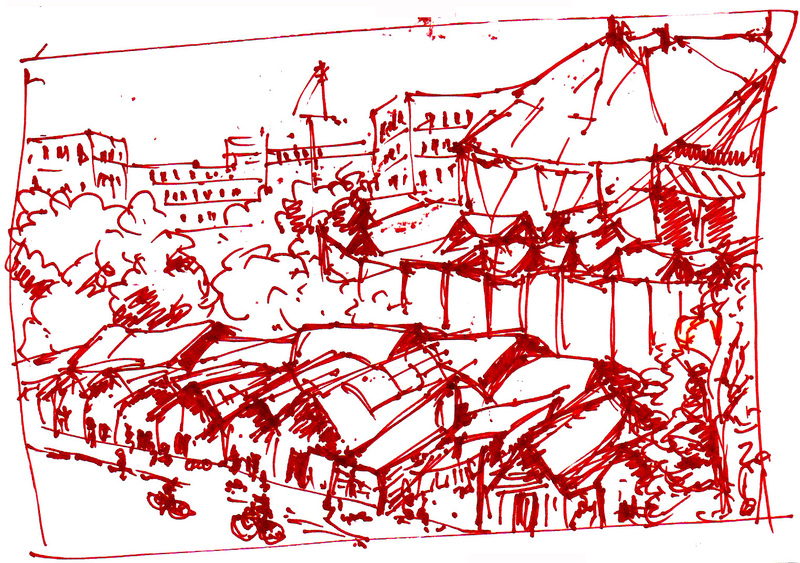 Soon after I completed the sketch I went to a Coffee Shop in a famous mall closeby and drank scalding hot masala chai. I was in no hurry to return home on such a beautiful wet afternoon. I walk in a busy street in T Nagar. 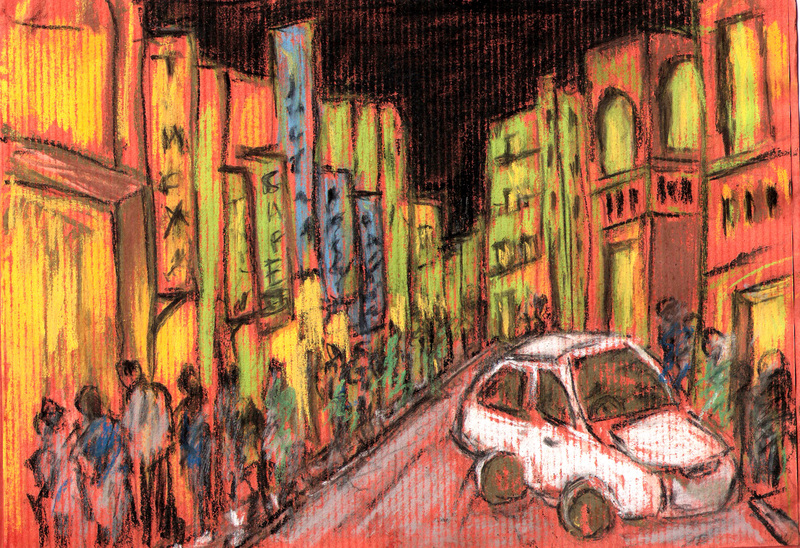 It is past nine in the evening, groups of people unload from autos and cars. There are psychedelic lights and signboards in greens, blues and yellows. It is the Ramadan month, after a long day of fast and prayers a beautiful evening is just opening up, and it will be hours before this street curls up for the night. No, this is not Kabuli wallah or Guru Gobind Singh. I found him outside Sairam Mandir in Mylapore enjoying his bedi. 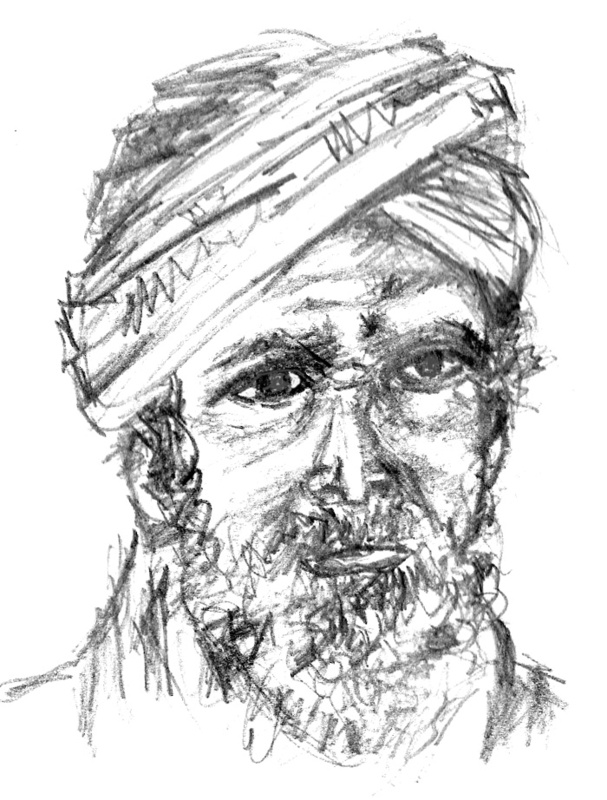 And that’s not a turban but a dirty towel wrapped around the head in great haste. I saw him remove it to reach for the bedi rolled in the folds, then he deftly wrapped his head with the grime laden cloth. I took a photograph of him from across the road and worked wholly from zooming in on the photo. However I observed him long enough to remember the expression on his face. I would love to invite him to model for me for charcoal and water colour studies. But I am not sure if I will be able to brook his disarming gaze. How many rides I have taken in a rickshaw as a child with my grandmother, mother and aunts in the Mylapore area! I went to the temple with my grandmother in a rickshaw. I joined my mother and aunts in their shopping because I knew I would get a ride back home. I was made to sit on the wooden seat where my bottom ached from being crammed. But I loved the view from there. 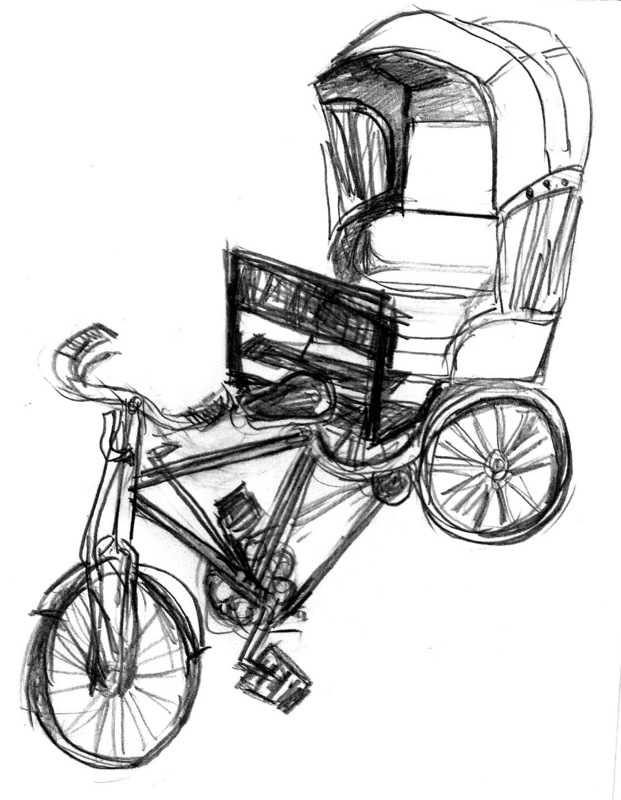 The sun-cover on top of the rickshaw can be flapped shut, I loved riding that way with the wind on my face. I always pitied the poor man who rode us home with all our shopping bags. 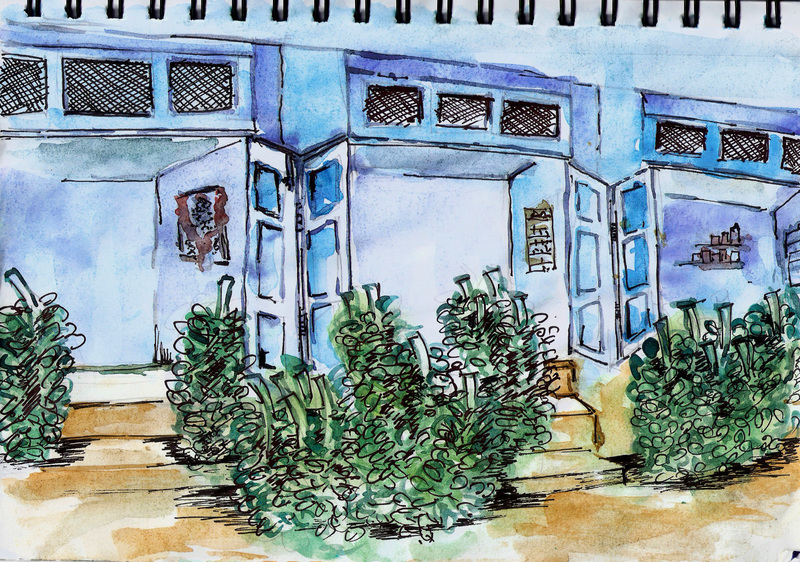 This is an old house in the Santhome area not very far from the Bay of Bengal. 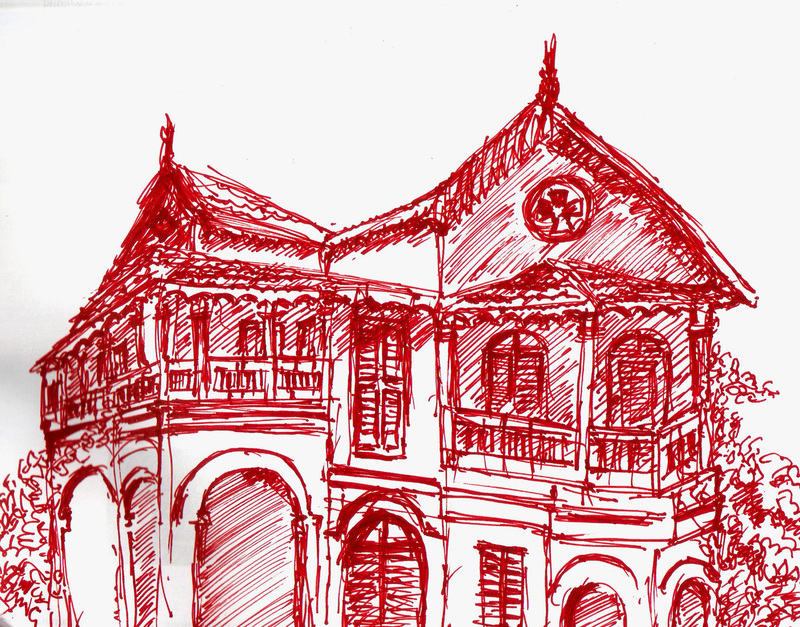 I have used a water resistant pen to sketch the house. I then coloured the sky at the Photoshop: selected the area with the magic wand and filled deep blue with the paint bucket. I wonder if the blue sky is suggestive of the deep blue sea beyond. Or, do you like this? Where do you experience the sea? Reproduction and the management of reproduction process is not just biological but cultural. It is in fact a terrain where class and gender intersect. In earlier times discussion of childbirth was considered a taboo, a business of women, confined to a dark room in the house where men were kept away. Deliveries were kept at home overseen by elder women members of the family or a midwife . Child birth and post natal care in India remained out of the orbit of medicalization till about late eighteenth century and early nineteenth century. The medicalization of child birth or biomedical childbirth as against non medicalized childbirth is a process whereby medical establishments with professional doctors follow standardized guidelines of medical care and treatment. Biomedical childbirth reduced risks of infant and maternal mortality. Madras played a prominent role in the history of obstetrics in British India. The first ‘lying in’ allopathic maternity hospital in British India and in Asia as a whole was built on the banks of River Cooum in Egmore in 1844 and moved to the present site in 1882. Called the Women and General Hospital or just Maternity Hospital (MH) or Prasava Aaspathiri, it served as the premier training center for obstetrics and gynaeocology. Initially the hospital provided services to British women residents and the Anglo Indian community, later it opened doors to women of all communities and races. Today it handles 22,000 deliveries annually. 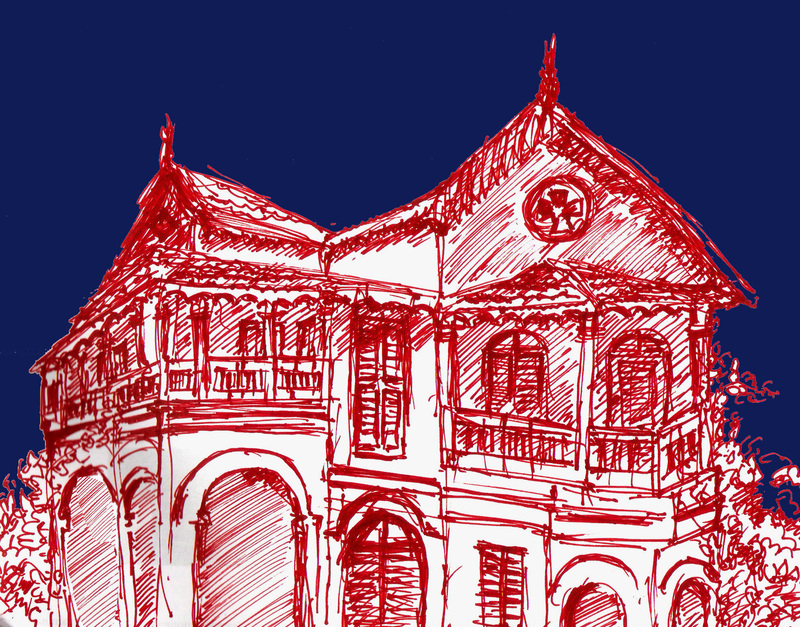 The building has a character of its own, a simple and functional colonial structure: tiled, arches that run the length o f the building, balustraded parapet and an Indo saracenic tower. The building has always fascinated me because of the wear and tear it has been able to take, it is not a museum but a place where thousands of people throng everyday. There is life in the building and will stand for a few hundred years more despite the overuse and poor maintenance.